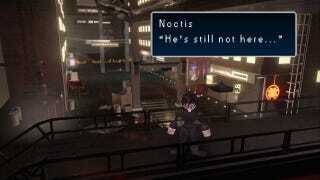 Final Fantasy Versus XIII sometimes feels like it's been in development forever. So let's pretend that it has. And that "forever" is really "since 1997". Artist Saku Hatakka has done the above image, which takes the look of the oft-delayed Square game and takes it back in time to the Final Fantasy VII engine. "It was a lot of fun trying to figure out how Squaresoft used to do prerendered backgrounds and adding low poly realtime 3D characters on top of them", he says. "Intentionally downsampling images and using low quality frame buffer effects was surprisingly fun!" FF Versus XIII x FFVII [spatsart, thanks Tamas! ].